If you have played Fallout 3 / New Vegas, then no doubt you've heard and probably used Cipscis' Automatic Save Manager, more commonly known as CASM. I've been looking for something similar for Skyrim, but so far haven't seen anything remotely comparable to it, so this is my attempt at implementing and perhaps improving on some of the original concepts. Autosave Manager - as the name suggests - manages your saves and autosaves in various ways. It supports several types of Save-Triggers, as well as Save-Targets as described below. Event - various events (listed below) will automatically trigger a Save Event, much like the default autosaves' OnTravel and OnWait events. Timed - will perform regular Save Events on a given frequency. Manual - will perform an explicit Save Event when a hotkey is pressed. *: These events are virtually the same AutoSave events that the vanilla game engine supports. 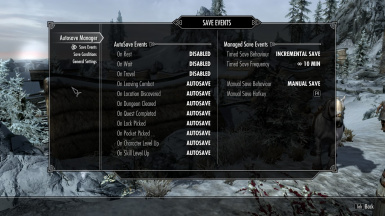 They are intented to replace the original autosave functions, should you chose to use this mod's implementation instead. Make sure you disable them in the game settings if you enable it in the mod. **: This event is a little bit tricky and may not always detect it when fast-travelling. Be aware of this when relying on these autosaves. ***: This event is similar to Location Discovered - yet different. It gets triggered whenever you enter a "named" location in the world. Most open towns, dungeon entrances and even little shacks and points-of-interests are like these. To avoid spamming and simply riding through a village like mad, it only gets triggered when you stay for several seconds within the area. AutoSave - A normal AutoSave will be created, the game stores 3 AutoSave files and cycles between these. Incremental Save - Similar to CASM's implementation, a custom set of numbered saves will be created and recycled over and over. Manual Save - A normal Save, as if you've opened the game menu and saved there. 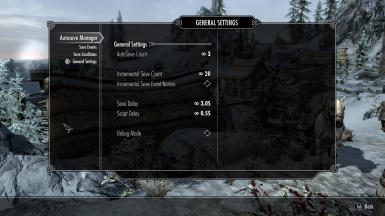 AutoSave Count - Number of AutoSave files, applies to the vanilla autosaves as well. Incremental Save Count - Number of incremental save files. Incremental Save Event-Names - By default, the incremental saves files created are based on the following naming formula: "CharacterName, AutoSave #". Enabling this option will replace "AutoSave" with a short version of the event name, ex "CharacterName, Combat 2", "CharacterName, Quest 3". This can effectively multiply your save-count tenfolds, so you may want to lower the number of incremental save count. Incremental Save Notifications - Toggles the notifications shown for this save type. No Activity Timer - Whenever an automatic save is created, further events will be ignored for this duration to decrease event-spamming. Rest, Wait and Travel events ignore this timer. Save Delay - After a save-event is detected, will delay saving with this duration. Script Delay - The lower this value, the more accurately events are detected. Debug Mode - Intended for development purposes, saves will not be created in this mode, save-reports are still generated. Download and activate with NMM or..
Uninstalling is simply a matter of removing the mod via NMM or manually, depending on your choice of install. The mod scripts are designed to automatically stop execution if the mod files are not found. Unless otherwise noted for a specific version, you can simply replace your existing installation with the new one. Some of the options may reset to default settings, so doublecheck your configuration. Also wait a couple in-game seconds before using the menu, as it takes a little time to update. Note: Some users reported problems with updating to 1.10 and 1.11 that a clean save resolved. While you shouldn't need a clean save for these versions, it is worth a try if you encounter issues in the MCMenu. 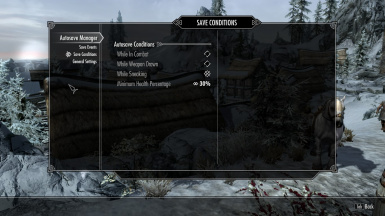 Saving while riding horse and/or dragons under some conditions with certain mods (RaceMenu, Dragonflying) can cause weird behaviour after reloading. Saves created with stressed combat situations can cause issues when restoring script states. It is recommended to disallow combat-saving (default value). ElminsterAU, Zilav and Sharlikran for TES5Edit. This mod requires SKSE, which is currently in Beta. You may need to update SKSE at some future date.